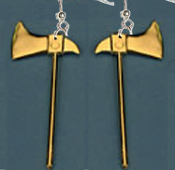 Funky Vintage AXE HATCHET EARRINGS - Mini Executioner FireFighter Wood-chopping Tool Charm Novelty Costume Jewelry - Miniature Camping BoyScout Campfire Gumball Machine Vending Toy. Detailed Gold-tone Plastic Charms, approx. 2.5-inch (6.25cm) long x 1-inch (2.5cm) wide.